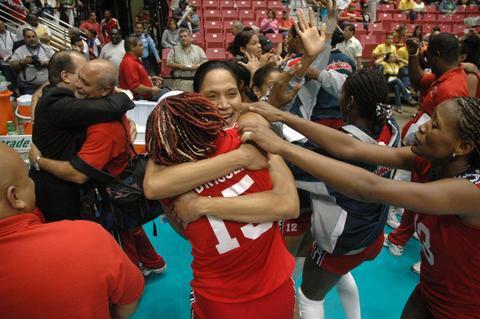 SAN JUAN, Puerto Rico, July 7, 2006.- Nurys Arias led a well balanced offense and Dominican Republic dominated USA in straight sets to obtain the bronze medal at the Women’s Pan American Cup. The Dominicans led all the way and relied on the strong blocking and serve location as two key ingredients for the triumph by score of 25-18, 25-22, 25-20. Arias scored 13 points and Cindy Rondon and Milagros Cabral each added 10, while Annerys Vargas and Cosiris Rodriguez contributed with 8 apiece. Nancy Metcalf and Katherine Wilkins were the Americans in double digits with 12 and 10 respectively. It is the third victory of Dominican Republic over USA in the history of this event, prevailing also in 2002 and last year. The Dominicans also scored a triumph over the Americans at the Athens Olympics.